This restaurant is located just up the hill from the East Village area about two minutes from the downtown San Diego area. As the downtown development continues to move east you will already be there and ready for it. Owners have set this restaurant up very nicely to serve a variety of delicious and well received foods. Continue as BBQ or expand to your own concept! The yelp reviews are terrific. Restaurant is located on the corner of a busy intersection with outstanding visibility. Vehicle traffic cannot miss this place. The surrounding neighborhood has a good mix of business and residential creating ideal demographics for this type of quick serve restaurant. The location would also be ideal for an operator looking to take it to the next level by adding a beer and wine license. Cheers anyone? With the oversized roll up style windows offering a view of downtown this could be the next neighborhood hot spot. They have a nice bar/counter area and the interior décor is perfect for that type of operation. The kitchen has all the equipment you would need for nearly any type of concept or operation. 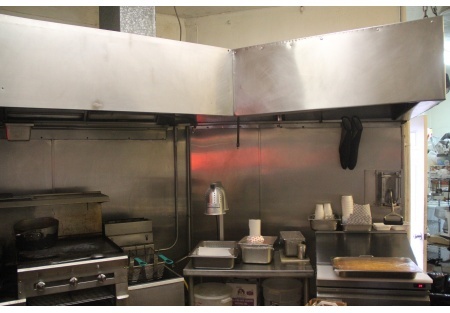 The hood and exhaust system covers the four burner stove/oven, a 36” griddle and double deep fryer’s. There is plenty of cold storage with two separate refrigerated prep tables and even a walk-in cooler. Kitchen is well designed for easy, compact and time saving prep and cooking in mind. All equipment you would need is here in a super clean stainless walled kitchen. With no advertising the gross sales for 2015 are projected to be in the 200k range or approximately 15-20k per month. The all in rent is only $2700.00 per month leaving a lot of flow through available to the bottom line. The space is approximately 1200 square feet and the landlord is willing to work with you on terms and duration of lease. There is plenty of street parking available and a lot next door that for additional parking. An owner operator could really do well here! Are you ready to roll up your sleeves, get to work and make some serious money?